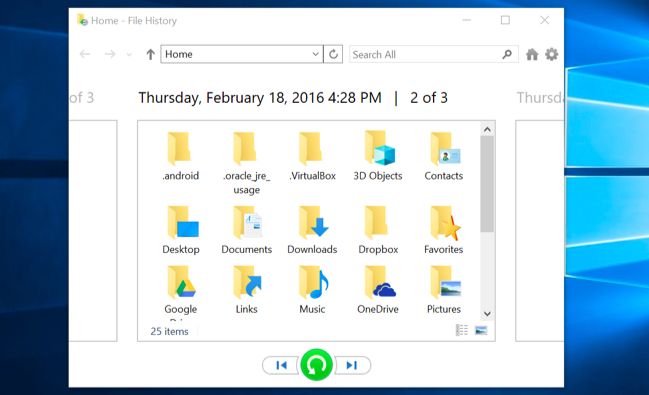 File History is Windows 10’s main backup tool, originally introduced in Windows 8. 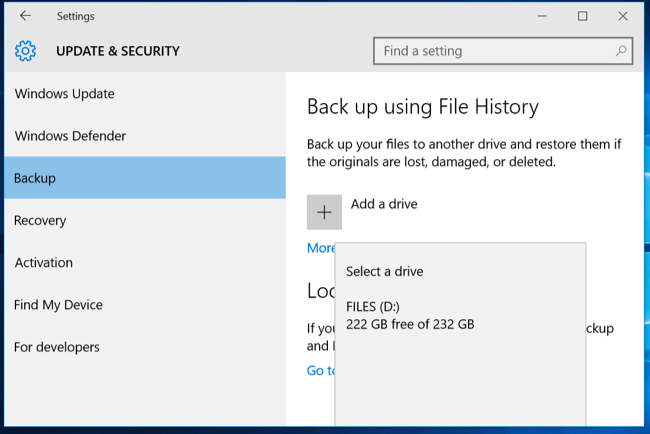 Despite the name, File History isn’t just a way to restore previous versions of files–it’s a fully-featured backup tool. 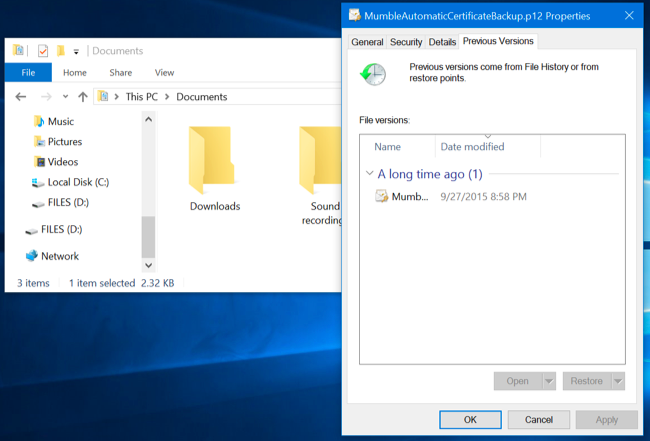 After you set up File History, you can just connect an external drive to your computer and Windows will automatically back up your files to it. Leave it connected and Windows will back up automatically on a schedule. Click or tap the “Add a drive” option under Back up using File History to add an external drive that File History will back up to. It’ll list external drives and give you the option to back up to them.File History is designed to be quick and easy to enable, unlike other complex backup tools. To enable it, first connect an external hard drive to your computer. Next, open the Settings app from your Start menu. Navigate to Update & Security > Backup. You could also use the Control Panel for this, but we’ll be covering the new Settings interface here. If you’d like to use the Control Panel instead (for example, if you’re still on Windows 8), open the Control Panel and navigate to System and Security > File History. Select a drive, and Windows will use it for File History. The “Automatically back up my files” option will appear and be automatically turned on. Windows will automatically back up your files to the drive whenever you connect it to your computer. Select “More options” to configure how often File History backs up, how long it keeps those backup copies, and–most importantly–which files it backs up. File History automatically backs up your files every hour by default, but you can select a different time here. You can choose once every 10 minutes, 15 minutes, 20 minutes, 30 minutes, 1 hour, 3 hours, 6 hours, 12 hours, or once per day. It will normally keep your backups forever, but you can have it delete them when they become one month, 3 months, 6 months, 9 months, 1 year, or 2 years old. You can also have File History automatically delete backups as necessary to make space on your File History drive. By default, File History will be set to back up back up important folders in your user account’s home folder. This includes the Desktop, Documents, Downloads, Music, Pictures, Videos folders. It also includes the Roaming folder where many programs store application data, your OneDrive folder, and other folders. 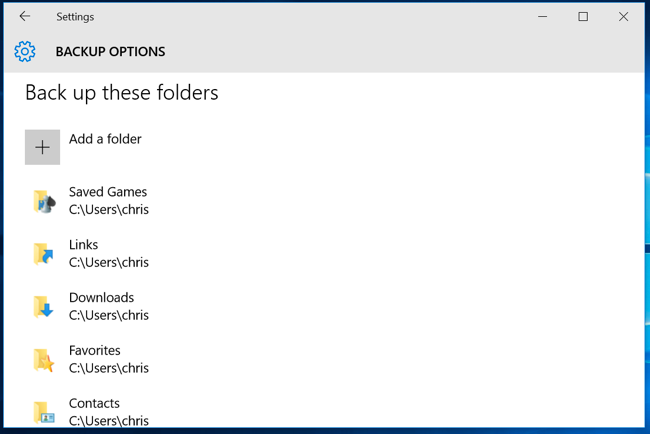 You can check the full list of folders in this window, and add more folders. Select “Add a folder” and you’ll be able to choose any folder on your computer to back up. You can also select a folder here and use the “Remove” button to prevent Windows from backing it up. NOTE: In Windows 8, you do not have the option to add folders from File History–instead, you must add folders to a Library in order for them to be included. You’ll also find an “Exclude these folders” section that allows you to exclude specific subfolders from being backed up. For example, you could have Windows automatically back up every folder in your Documents folder, but ignore one particular folder. In Windows 8, you’ll find this on the left-hand side of the File History window. To start backing up to a different drive, use the “Stop using drive” button. This allows you to stop backing up to your current drive and start backing up to a new one. 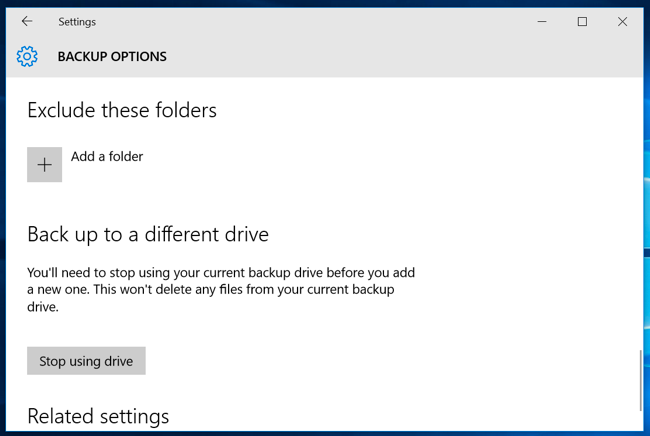 The backups won’t be deleted, but Windows can only be configured to back up to one drive at once. The “See advanced settings” link here takes you to the Control Panel, which offers another interface you can use to configure File History. 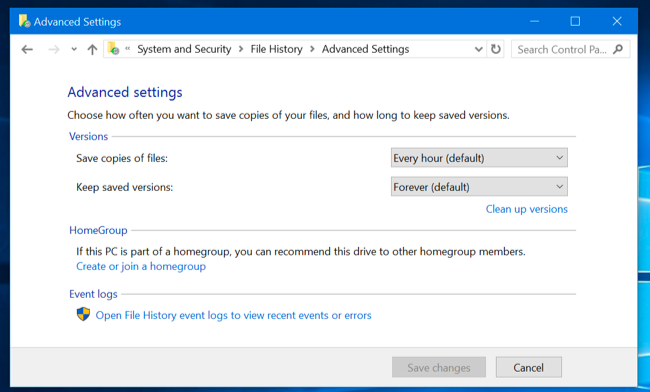 Click “Advanced Settings” here and you’ll find a few more options, including the ability to view recent errors in the Event Viewer, clean up old versions of files, and allow other computers that are part of your homegroup to back up to your drive. To choose a time period, click the arrow buttons or the panes at the side of the window. You’ll also be informed how many different backup time periods are available. 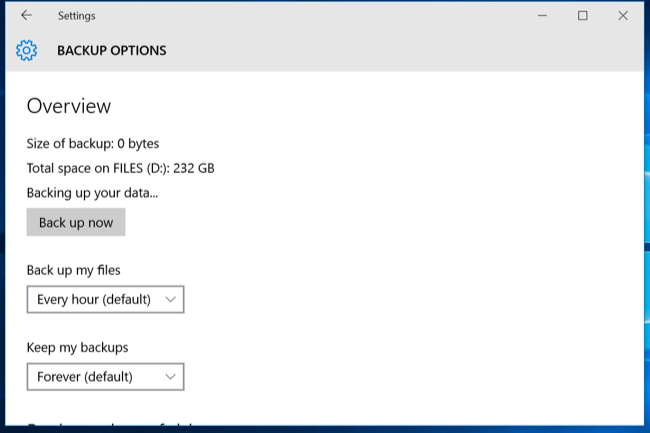 For example, in the screenshot below, the “2 of 3” at the top of the window indicates there are three available backups, and we’re viewing the second one. There’s one older backup available, as well as one newer one. Any available previous versions of the file from File History will be available here. You can preview them, restore one to its original location, or restore a previous version to a different location on your computer. You’ll be presented with a list of files you can restore that were once in the folder. This is the same interface you’d use when restoring files normally, but File Explorer allows you to start from within a specific folder to speed things up. 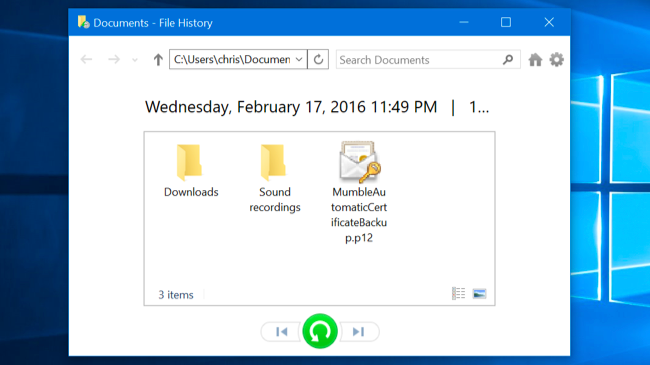 File History is a very simple and useful backup option, and for it’s completely free. 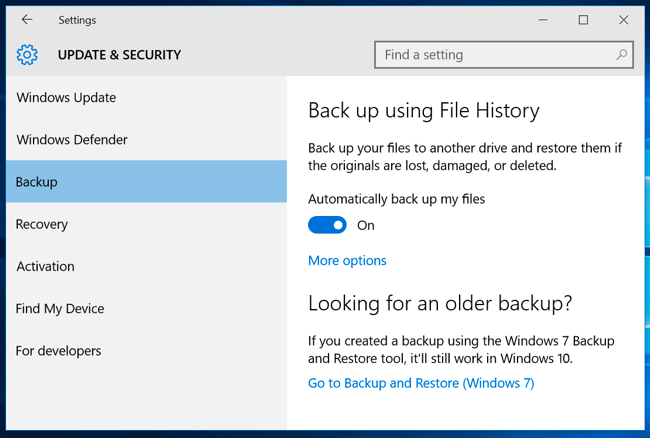 Windows 10 also allows you to create a system image backup if you want a full backup copy of your operating system state. This isn’t the ideal solution for backing up your files–even if you make system image backups, you should be creating more frequent backups of your important files with File History–but some geeks may find it useful if they’re playing with the Registry or other system files.